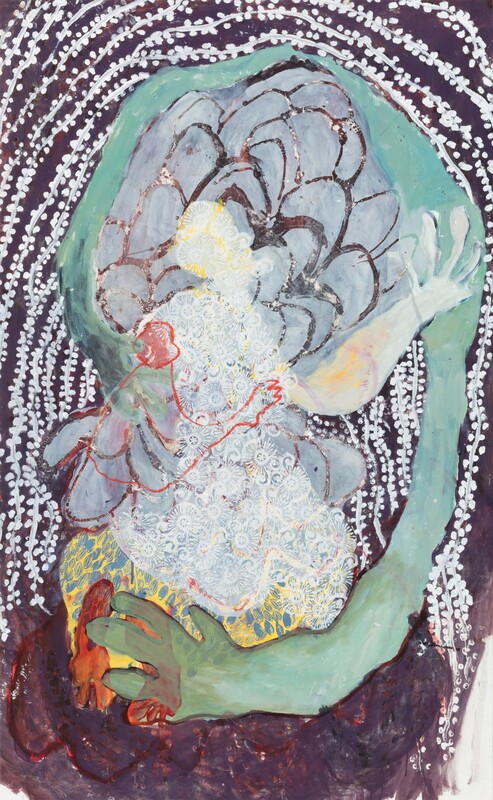 Portia Zvavahera’s vast canvases contain a world of dreamscapes heavy with burdens of our futures and unresolved pasts. The women depicted in her paintings, however, are not always in despair. Often they appear to be tenderly holding spaces for each other; there is no pain without comfort. Ever present in Zvavahera’s work are the entangled worlds of the spiritual and the ancestral, worlds that are protective, demanding, and at times even petty. 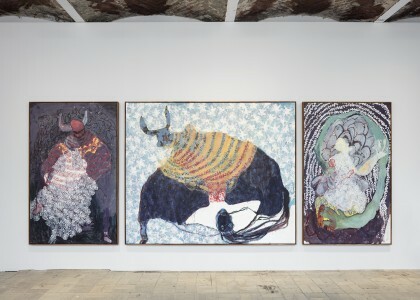 In Hapana Chitsva (All is Ancient, 2018) a triptych created during her recent artist residence in Bangalore, one can sense an expansion of her spiritual understanding. Figures adorned in laced patterns surrender to protective creatures with horns; the tail of a large bull is transformed into the head of a serpent. Of her time in India, Zvavahera speaks of feeling both challenged by the differences in her understanding of spirituality and optimistic about the recognition of a shared resistance against the powers that have threatened our humanity. Through her mind’s eye Zvavahera transports us deeper and deeper towards our true selves. You can escape but you’ll always need to come back.